Born in Ballyshannon, County Donegal, he moved at an early age to the delightful town of Cork in the Southeast corner of Eire and regards that as home. He has been playing the guitar almost forever and was bought his first real guitar when he was nine. That replaced an earlier plastic model on which he had delighted friends and relations with renditions of hits by Gene Autry and Rory Rogers. Rory joined the Fontana Showband, later renamed Impact, with whom he spent two and one-half years playing all over Ireland, touring Spain and performing a few English dates. Lonnie Donegan was Rory's first real hero - "he really tore those songs out of himself" - to be followed by Eddie Cochran, Buddy Holly, and Chuck Berry. When the showband broke up, he got the chance to play hard rock exclusively; he, the drummer and bassist, went over to Hamburg in the summer of 1965. Back in Ireland, a few months later, Taste was born. "We played around Ireland, did another trip to Hamburg, then finally made the big step over to London in 1969." "We came in May on the strength of a promise we had from the agent who fixed out German gigs, which didn't work out, but finally I changed the lineup, bringing in Richard McCracken and John Wilson, we did an audition and ended up with a recording contract with Polydor." Taste made two albums, called "Taste" and "On the Boards" - the title being a reminder that Taste had built up their huge following entirely on the strength of their volcanic live appearances - and shortly after the band finally broke up, ""live Taste", recorded at Montreux, was released and made the charts. With Taste behind him, Rory spent the early months of 1971 laying the foundations for a new band to continue where Taste left off. With fellow Irishmen Wilgar Campbell on drums and Gerry McAvoy on bass backing Rory, he made his first album in February and March at Advison Studios. 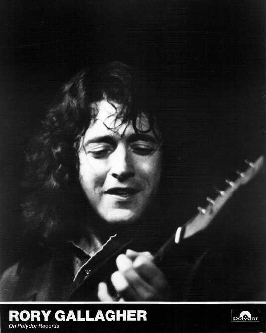 With Vincent Crane of Atomic Rooster playing piano on a couple of tracks, the album was simply entitled "Rory Gallagher", and gave a wider picture of his talents than previously. Taste's asset was its ability to generate physical excitement, to which the new album added depth and subtlety. Two more albums followed Rory, Wilgar and Gerry - "Deuce" and "Live in Europe" and it was the latter which at last brought the giant breakthrough in record sales. The band first visited America in Autumn 1971, although well down the bill, gained a tremendous reaction. His return trip in summer 1972 consolidated that success. It was during the American tour that Rory revealed publicly the most dramatic news of his career - the addition of keyboard played, Lou Martin. Lou came from the Irish group, Killing Floor, and his arrival added enormous depth to the Gallagher sound. This sound was captured on the album "Blueprint", released in February 1973. The same month saw the debut of the new band in Britain in a lengthy concert tour. His return to America in the summer brought further acclaim and Rory now spends his time 'commuting' between Britain, America and Ireland. In late 1973, the band produced their album "Tattoo" , which reflected the broadening horizons of the musicians and was a more adventurous work than they had previously undertaken. Then came the raw and earthy "Irish Tour '74' ". This double album provided a valuable insight into the stunning excitement that Rory and the band generate on stage and captured all the spontaneity of a live performance. Film director, Tony Palmer, took a film crew on tour with the band, and produced a full feature documentary titled "Rory Gallagher- Irish Tour '74' ". Both the album and the film provided a wealth of powerful virtuoso material. Rory's 1974 visit to the States was his most successful to date, and the beginnings of 1975 has seen a triumphant return visit to Japan, his first trip 'down under' to Australia - where the response to Rory and his performances, although previously unknown there, was overwhelming good as was the release of his LP "Sinner and Saint". Rory's latest Polydor album titled "The Story So Far" is being released in March.